Hope you've all had a wonderful holiday. It's been snowing for two days here which is highly unusual for the Christmas, much less, the south. 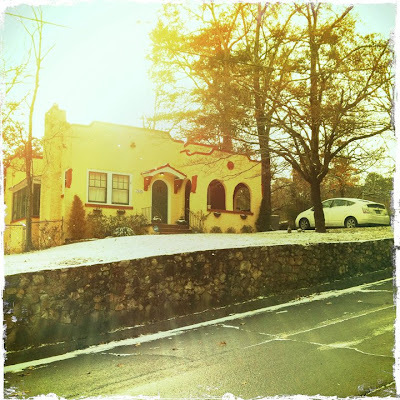 Here's a shot I took of the house this morning while walking the icy roads with one of the pups. I saw this video on diy homemade marshmallows by lauren and derek a few years ago on design*sponge and have been making them every Christmas since. I made my first batch of the year last night. I've also got the goodies to make homemade hot cocoa which will make great gifts for friends this year. Yum. I never knew it could be so easy. Pantone iPhone and iPad cases. Camelion Floor Tiles by IVANKA are the most amazing concrete tiles I've seen. I want these in my kitchen! Hell, I want them in my entire house. Thanks for the link, Monica! and the daily meal, a single wall to the east shields the monk from the morning sun. - the second period, from 12:00 to 20:00: during the time for studying the buddha’s teachings, the simple roof overhead shields the monk from the daytime sun. - third period, from 20:00 to 04:00: chanting and meditation takes place in a space exposed to the elements, and the monk then sleeps under the hanging mosquito net umbrella.